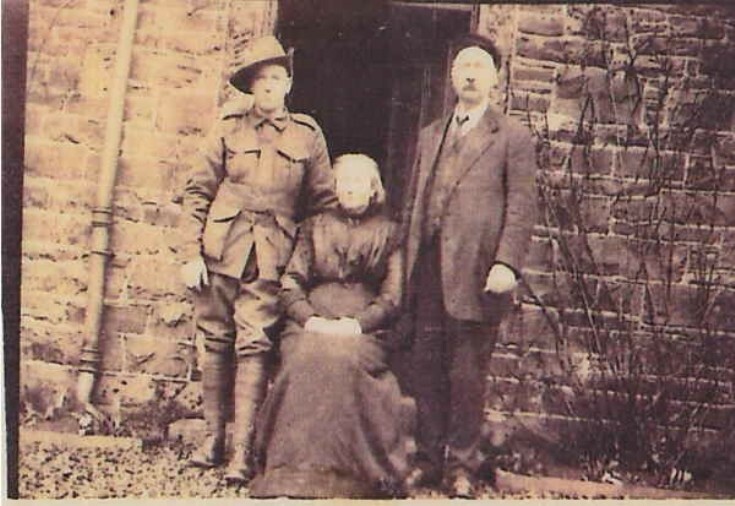 This is my great uncle George "Geordie" Cunningam from Tasmania, Australia with his Aunt & Uncle in Cromarty. My great grandfather George Russell Cunningham of Church Street Cromarty left Cromarty and emigrated to Tasmania where he married Harriette Anderson and had a family. During World War One several of the Cunningham boys enlisted and served in Gallipoli and the Western Front. During a period of leave some of the brothers visited Cromarty and met their relatives. This photo is labelled Geordie with Aunt & Uncle. Unfortunately they would not have been able to meet their grandfather Alexander Cunninham, as he had died in 1905. George had 13 Children. Ten boys and three girls. I am his great grand daughter.